Unique venue available for corporate events & private parties. Watch the video below to learn more & contact us TODAY! Welcome to Hop21, the Twin Cities one & only Table Tennis Club & Bar. Hop21 is a unique 4,500 square feet contemporary-chic venue with 7 ping-pong courts, full bar, great bar food, and a variety of lounge seating. Hop21 is open for tournaments, corporate and team building events, wedding receptions, birthday parties, and fundraisers. Please Note: Hop21 reserves the right to close early without prior announcement on slow nights. 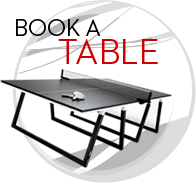 Single ping-pong table reservations are limited to: TWO hours Sun -Thur and ONE hour Fri-Sat. We don’t take table reservations past 8PM Friday-Saturday. However, feel free to call or come in for open availability. please CALL 612.245.1000 during the day or 612.315.2964 after 4PM. Your reservation is valid ONLY after you receive a confirmation! We are happy to hold your table for 10 minutes after your reservation time. If you’re running late, please give us a call at 612.315.2964. We offer 4,500 square feet of contemporary-chic space that can comfortably accommodate your intimate group of 20 or your grand affair of 120 guests. Hop21 is ideal for birthday or holiday parties, team building events, or receptions. 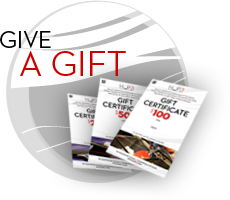 A perfect Gift this Holiday Season or for any occasion! 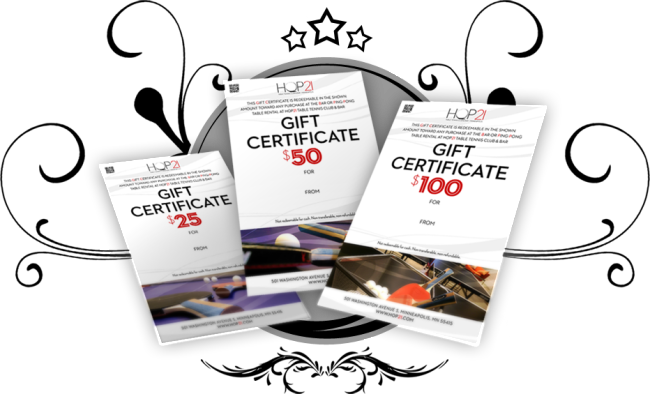 To order Gift Certificate please call (612)315-2964 or email play@hop21.com. Ready to play? Planning a party? Interested in bringing your company or a group of friends to Hop21? Please feel free to give us a call or email us for any pong or booking related inquiries. © 2015 Copyright Hop21. All Rights Reserved.